Welcome to Chanel under the sea. 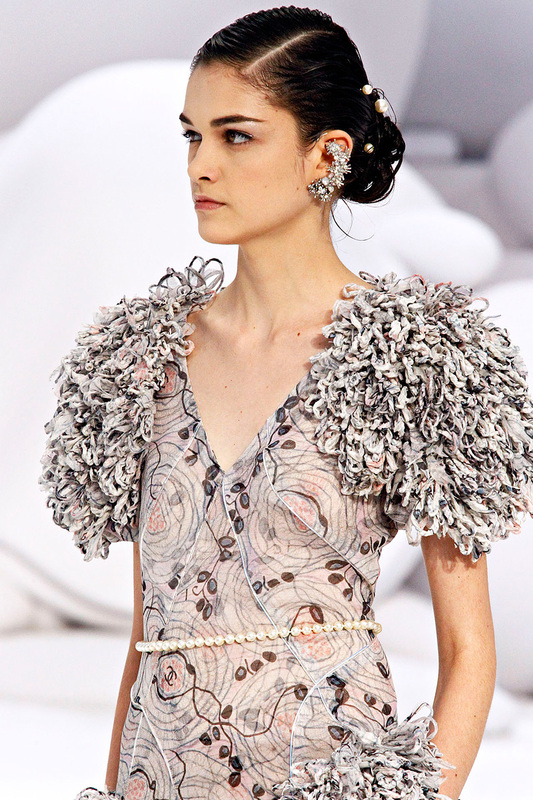 Karl Lagerfeld indulges in an aquatic whimsy this season, complete with glimmering coral and gleaming white sand. [Trust the Kaiser to herald the next great influence.] Mais oui, he gives us a rather dreamy poetic perspective of the ocean floor with the models emerging like seas goddesses from the mysterious underworld caves. But what I love the most is how Lagerfeld has transformed iconic Chanel classics, deconstructing the signature tweed jackets and famous pearl strands. The iconic boxy Chanel jacket is modernized with shimmering waffled fabrics in a lovely palette of “sea foam, shell pink, and mother-of-pearl.” [That particular shade of sea foam is oh so pretty and very perfect for spring.] Largerfeld puts his not-so-inconsiderable technique to work, adding resplendent texture to structured tweed and frothy organza. It is quite lovely how the light hits this iridescent pieces in just the right way, giving this entire collection a rather ethereal glow about it. The textured knits provide an intriguing sense of depth to the collection and add to the fantasy the fantastical sea world Lagerfeld builds. Moreover, I adore how this collection is liberally festooned with pearls. Rather than luxuriously draping them across the throat, he cast them in an edgier light by placing them on a model’s face like an opulent piercing while the understated elegance of pearl earrings has given way to intricately fierce ear cuffs. I see them more as part of Chanel beauty rather than accessory. It reminds me of how the Kaiser did tattooed pearl strands and chains back in Spring 2010. He always manages to take seemingly incongruous things and fit them to the Chanel aesthetic. All in all, this a fabulously frothy collection with plenty of pretty to satisfy both the ladies-who-lunch and the ever-trendy socialite. Oh, and how fantastic does Florence Welch look performing?